AT&T will complete its fiber buildout to areas designated to get fiber to the home service by mid-2019, according to AT&T executives. John J. Stephens, AT&T’s chief financial officer, told investors on a quarterly conference call that AT&T is on schedule to complete expansion of its fiber to the home commitment to 12.5 million new customer locations, a regulator-required commitment imposed on AT&T in return for approval of its acquisition of DirecTV. “We are getting near the end of our fiber build project, which is basically laying the foundation for stabilizing our broadband and TV business profits in 2019,” added AT&T CEO Randall Stephenson. AT&T’s expansion has targeted millions of customer locations for fiber to the home service, replacing the fiber to the neighborhood technology AT&T used for several years to support its U-verse service. AT&T officials say its fiber network will reach more than one million new customers during 2018. That network is key to two AT&T initiatives – its emerging 5G wireless service, which requires fiber connections to cell towers, and AT&T Fiber and its broadband offerings — helping boost internet and online video revenue. 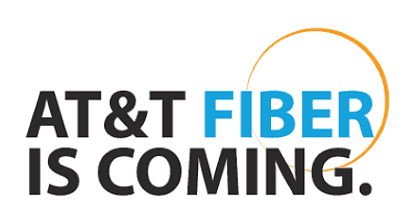 AT&T Fiber is critical to the company’s ability to compete in the home broadband market against cable operators that have recently boosted internet speeds. AT&T’s hybrid fiber-copper U-verse system proved inadequate to match the significantly faster internet speeds many cable operators are rolling out. But AT&T Fiber will not reach all the company’s landline customers. Rural areas are unlikely to ever receive fiber upgrades and AT&T has had long-term plans to scrap its rural landline network, transitioning those customers to wireless voice and internet using AT&T’s 4G LTE network. Serendipitous timing. I just had AT&T Fiber installed to my home yesterday. U-verse was available a few blocks away, but never to my home. 3 months ago, I saw them stringing fiber in my back yard, so I started checking their website weekly. The tech said I was their third fiber customer in the area. — Zero marketing has gone out about the availability. Very pleased with 100/100 meg service for $50. I’m very thankful to live in an AT&T Fiber Market. The picture quality with their U-Verse TV service is so much better on Fiber than it ever was on last mile copper. Not to mention the service has been rock solid here with gigabit internet. When both Hurricanes Michael and Florence passed through the lowcountry of South Carolina AT&T fiber stayed up and running. I live in what has to be one of the last MDUs in Austin wired for copper by AT&T rather than fiber. Until June, 50/10 was the highest available speed here, though that was doable over a single pair because we’re 1020 wire feet from the nearest VRAD. I ended up on the fastest copper tier they’ll sell on actual FTTN (rather than GFast, which would require fiber to the building): 100/20. Not bad…until you realize that 200/10 is Spectrum’s standard tier here. Upload speeds aside, cable literally picks up where copper-based U-Verse leaves off…if youu have ideal U-Verse conditions (which I did). Of course, any new builds (of which there are plenty) are getting AT&T FTTH, which is great for folks who can get it! For everyone else, soe brownfield builds are happening, but not to the extent that seems to be happening in other areas. Now, for rural areas, it’ll be interesting to see whether AT&T tries using 5G there. Catch being, small cells at high frequencies aren’t going to provide reliable service when folks are miles from the transmitter, so we’re talking about a totally different deployment strategy than urban 5G. If you can throw a signal a few miles though, the backhaul problem has largely been solved already thanks to fiber-to-the-tower requirements from LTE builds.